Since WALL•E rolled onto the screen last weekend, I have heard one word more than any other in my house: DIRECTIVE. Without giving too much of the film away, EVE has a mission, her DIRECTIVE, and she is set on completing her task. Meanwhile, WALL•E, and his hopelessly romantic motherboard, wants nothing more than to hold EVE’s hand. Whether you have known my wife and I as long as we have been together or have never met my wife and I, you saw us in those scenes on the screen. It does not matter if my wife is cooking dinner, working on a paper for work, or trying to talk to a friend on the phone, I seemingly always want her attention for some simple romantical-type gesture. And, just like clockwork, she always reminds me that she has a DIRECTIVE she must complete, and now she has one word to use in place of a frustrated lecture, thanks Pixar! Thinking over WALL•E this week, I decided that I did not know film well enough to put together a full review. However, it was a fantastic film and I wanted to pay my respects for the extraordinary work done in the picture, aside from the cute story above. Then I remembered this article I wrote about WALL•E inside the theme parks. If you haven’t read it before, enjoy it for its pre-premiere ideas of WALL•E’s place in the parks, if you have read it before, then excuse the fact that it could most certainly do with an update, but overall just enjoy. According to sources we are not alone. To be perfectly honest, we aren’t even here any longer, at least not by the time we meet WALL•E, the Waste Allocation Load Lifter Earth-class. That’s right, seven hundred years in WALL•E’s past, all human life left earth, making WALL•E our planet’s future. What does this mean? It means we should all become accustomed to seeing WALL•E and his friends around Walt Disney World. 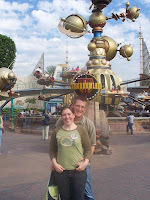 A while back we talked about the animation invasion of Tomorrowland. To sum up, I am not thrilled with what Tomorrowland has become, but I am not yet ready to write off the entire land yet. I have been waiting for the right vehicle to come along to restore some since of order to the future. I didn’t think that a little robot from Pixar’s next triumph (as it is already being touted) would be the key, especially with the current disdain amongst enthusiasts about the current state of Tomorrowland, but it truly looks like the right time and place for WALL•E. Before going any further let me say that I have no inside information that says WALL•E is going to be fixture of any kind in Tomorrowland. In fact, WALL•E would be just as much at home in Future World, perhaps a message of conservation in The Land, replacing the much employed Simba and friends. Speaking of conservation, maybe WALL•E is the future of Animal Kingdom’s cautionary tales. The point is, I have no hard facts on this topic these are just well thought out opinions. Looking at the arguments against the existing Tomorrowland, we find two trains of thought. One, characters have no place in Tomorrowland, as Fantasyland is the home to characters and their stories. Two, the characters who are in Tomorrowland have little, if no, true connection to the future. We discussed characters being in Tomorrowland previously, so we won’t rehash that old tale. But what of the setting, the time and place of Tomorrowland? Making your way through Tomorrowland from the Tomorrowland Indy Speedway (let’s not linger here too long, this place just feels like a shift in the space-time continuum), to Space Mountain, and finally down towards Stitch’s Great Escape and Monsters Inc. Laugh Floor, and you find no real sense of time or place. While the architecture still speaks to the Future That Never Will Be, the overall environment does not. So we are left with a bland and general impression of the future. With WALL•E we at least have an idea of where he comes from, seven hundred years after we have abandoned planet, and that is definitely in our future. He also has a defined story, yet to be revealed, that we can draw from. So whether it is as a free-roaming audio animatronic (in the vein of Lucky the Dinosaur), or as a walk around character (with what I’ve seen him do to trash so far, he’ll put PUSH to shame), or even, dare I say it, as an attraction tie-in, I look forward to seeing more of WALL•E. I think he may be the bridge to tomorrow that Tomorrowland is missing. LOVED Wall-E! Saw it on a date with my hubby this weekend and thought it delightful. The pixar short was fabo too. Another disney hit! You and Aileen ARE SO Wall-E and Eve! Hilarious!